Several of the the Randolph Scott movies from the early 1950s had generic-seeming titles for a western (e.g. The Stranger Wore a Gun), and this is one of them. It came by the title honestly, taking it directly from its source novel by Ernest Haycox. 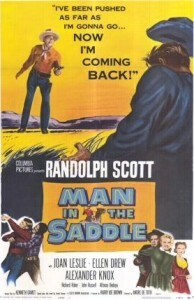 Behind that generic title, however, is a strong cast, a good director (one-eyed Hungarian André de Toth), and a complicated range war plot, with a lot of characters coming and going around another Randolph Scott romantic triangle (as in, for example, Canadian Pacific, A Lawless Street, Return of the Bad Men et al.). 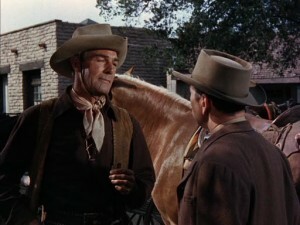 Owen Merritt (Randolph Scott) of the Christmas Creek Ranch is one of the smaller ranchers near the big Skull Ranch, owned by Will Isham (Alexander Knox). Merritt and Isham had both been courting Laurie Bidwell (Joan Leslie), from a poor family with an alcoholic father. Although she seems to prefer Merritt, Laurie has chosen Isham and security as the movie opens. Isham senses that she still has feelings for Merritt, and it makes him insecure, feeding his need to take over the valley by fair means or foul. 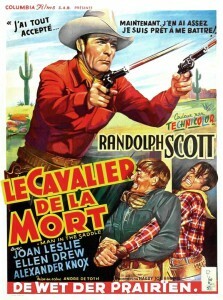 Owen Merritt (Randolph Scott) is threatened by his (much shorter) adversary Will Isham (Alexander Knox). As Merritt licks his emotional wounds, Isham has hired gunfighter Fay Dutcher (Richard Rober) as his foreman. One night just after the marriage, Merritt’s cattle are stampeded and Juke Vird, one of his hands, is killed. Juke’s brother George (a youngish Cameron Mitchell) goes into town looking trouble with the Skull hands. In a gunfight in a dark bar, one the Skull gunhands is killed, leading to a series of strikes and counterstrike between Merritt and the Skull outfit. George Vird is killed, and Merritt attacks a Skull line cabin. 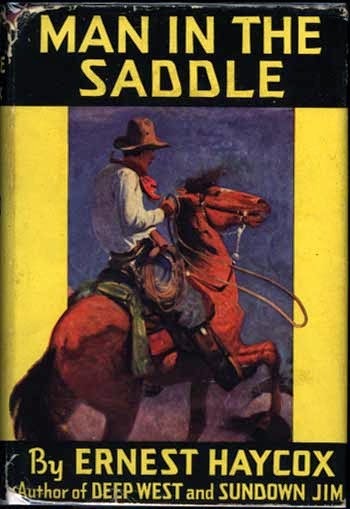 Merritt’s ranch is attacked and Merritt wounded; he is rescued by his neighbor Nan Melotte (Ellen Drew), who takes Merritt to her grandfather’s remote cabin to recover for a few days. They are found there by Hugh Clagg (John Russell), an unbalanced lone-wolf-type with a fixation on Nan. He tries to kill Merritt, but Merritt fights him off and Clagg makes his escape to the Skull Ranch. As Clagg makes accusations about the faithlessness of a woman, Isham thinks he’s referring to Laurie and shoots him in cold blood. He and his men head for town to ambush Merritt and his men there. 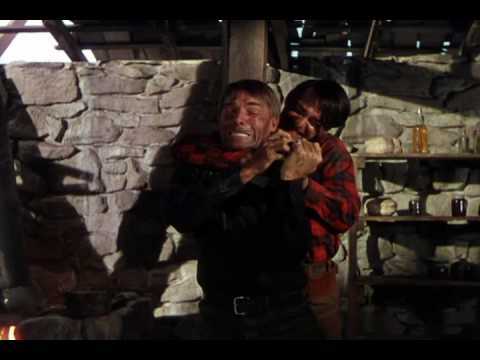 Owen Merritt (Randolph Scott) and Hugh Clagg (John Russell) fight for the hand of Nan Melotte in a collapsing cabin. Merritt and his men sneak into town in a dust storm dressed as Mexicans, with one of the Skull men who saw the Clagg shooting. They take him to the sheriff, where he fills out an affidavit. Isham’s men invade the jail, but Merritt goes after Isham. They reach an agreement that Isham will leave the valley, taking Laurie with him, but as Isham comes down the stairs of the hotel he is shot by his own foreman Dutcher. Merritt and Dutcher shoot it out, and we know what the outcome of that will be. The Skull Ranch now belongs to Laurie, and it seems that Nan and Merritt belong to each other. Merritt (Randolph Scott) fights Isham’s forces. Scott is good as he usually was, riding his horse Stardust (an uncredited co-star) and with his trademark leather jacket making at least one appearance. Joan Leslie and Ellen Drew are a little stronger than most women in Scott westerns. Alexander Knox is a bit too much of a megalomaniac in his one-note humorless performance, but his part seems to be written that way. The rest of the supporting cast is quite strong. John Russell is good as the unbalanced Hugh Clagg in one of the story’s more interesting and less predictable threads. Alfonso Bedoya was charming (he has a recurring bit about finding a new hat), but for modern tastes he seems rather an uncomfortably stereotypical Mexican in most of his roles, including this one. Guinn Williams (The Desperadoes, Virginia City, etc.) keeps his broad comic relief tendencies under control here as one of Merritt’s riders. 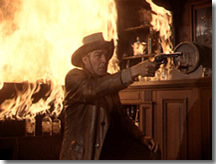 A surprising amount of the action takes place at night (the raids and counterstrikes and an impressive gunfight in a darkened saloon) or in a dust storm (the final developments and gunfights), emphasizing De Toth’s good direction and excellent cinematography. This was the first of De Toth’s six westerns with Scott, although he didn’t think Scott and his producing partner Harry Joe Brown paid enough attention to a film’s story as long as they were making money. In this case, the plot has a lot of convolutions for the film’s 87 minutes, but much of it is predictable bad big rancher vs. virtuous smaller rancher stuff when you start thinking about it. We get to see one of Randolph Scott’s patented fights in a collapsing/burning building (see Ten Wanted Men, Hangman’s Knot and Riding Shotgun, for other examples) when Clagg and Merritt tangle in an old cabin. 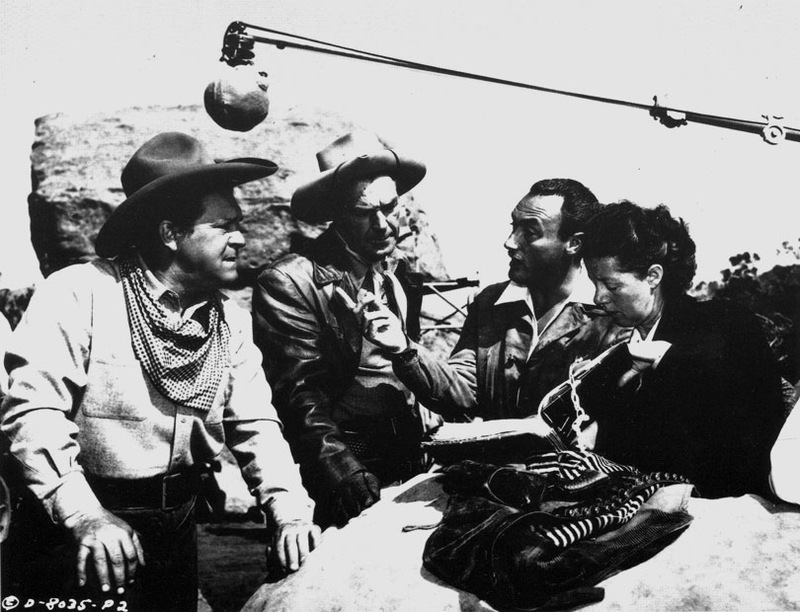 The excellent cinematography is by Charles Lawton, Jr., who did many good westerns, including 3:10 to Yuma with director Delmer Daves and several with Budd Boetticher. It has a better-than-average theme song, sung by Tennessee Ernie Ford in hist first film appearance. Kenneth Gamet, who wrote a number of Scott films (and a total of 44 westerns for the large and small screens, in fact), did the screenplay. Shot in color at Lone Pine, at 87 minutes. Director Andre de Toth confers with Guinn Williams and Randolph Scott during filming. 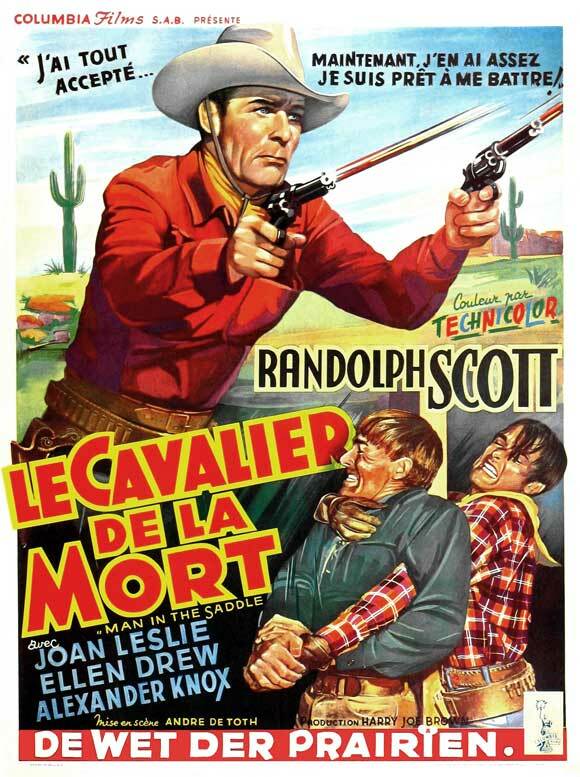 Although it’s not one of Randolph Scott’s very best westerns, it’s one of the better films from his pre-Budd Boetticher period and well worth watching. Some say it’s the best of the half-dozen De Toth-Scott collaborations, although you should see at least The Bounty Hunter, Thunder Over the Plains, Carson City and Riding Shotgun before deciding. De Toth’s very best westerns are probably his first (Ramrod, with Joel McCrea and Veronica Lake) and last (Day of the Outlaw, with Robert Ryan and Burl Ives). This entry was posted in Westerns Worth Watching and tagged Andre de Toth, Randolph Scott, Range Wars on July 16, 2015 by Nicholas Chennault.